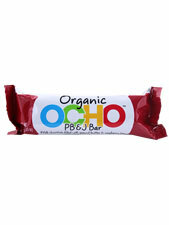 Have an Ocho Bar and enjoy your day. Additional Info: Made in the USA. Ingredients: Organic Milk Chocolate (Organic Sugar, Organic Cocoa Butter, Organic Whole Milk Powder, Organic Chocolate Liquor, Organic Soy Lecithin (Emulsifier), Organic Vanilla), Organic Raspberry jam (Organic Cane Sugar, Organic Seedless Raspberry Puree, Apple Pectin, Ascorbic Acid (Vitamin C), (Ctric Acid), Organic Peanut Butter (Organic Peanuts), Organic Peanut Flour, Organic Cocoa Butter, Organic Sugar (Organic Cane Sugar, Organic Tapioca Starch) and Sea Salt. Contains: Peanuts, Milk, Made on shared equipment that processes Peanuts, Tree Nuts, Milk and Eggs.